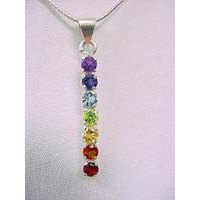 Tagged as chakra, chakras, jewellery, jewellry. From India. 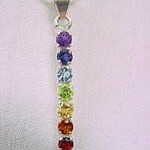 Faceted Chakra stones in a sterling silver setting. The seven chakras are wheels of bioenergetic activity radiating from nerve ganglia (clusters) that start at the base of the spine and continue on to the crown of the head. 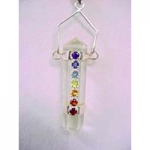 Chakra one: Base of spine. Associated with survival and security. Represented with Garnet. Chakra two: Lower abdomen. Associated with pleasure and sexuality. Represented with Carnelian. Chakra three: Solar plexus. Associated with the Self. Represented with Citrine. 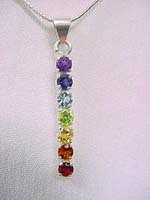 Chakra four: Just over the sternum. Associated with love and trust. Represented with Peridot. Chakra five: Throat. Associated with communication and expression. Represented with Blue Topaz. Chakra six: Center of forehead, brow. Associated with intuition and imagination. Represented with Iolite. Chakra seven: Top of head. Associated with knowledge and understanding. Represented with Amethyst.